Take note I am not a writer nor am I a professional ski technician . This is just my experience with the Ogre skis that I was able to demo . For those who are you will just have to carve through my opinion . During the 2009 / 2010 season I floated with the Ogre #1 , #2 , #8 . 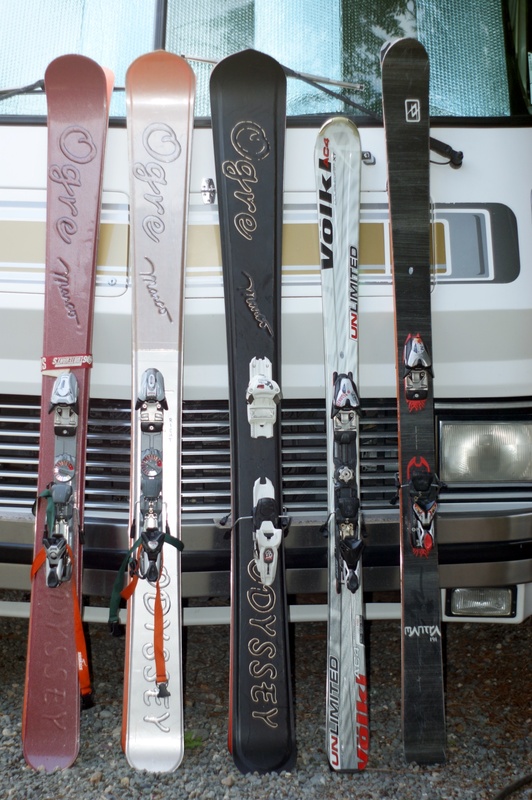 ( www.odysseyskis.com ) I will discuss each ski in the same order . I was able to demo the skis in this order also . Not intimidated by the heavy crud . A strong sturdy ski I was able to put all of my 214 pound 6'1" body into it power through my turns . As I am a tree skiing fool what I love most about this ski is its easy to turn with no worry of being able to sustain the turn . I trust this ski to do what I tell it when I make my move. Like Ogre #1 #2 #8 and not yet tested Ogre #10 the anti-dive tip out performs anything else I have ever skied on. Power and braking due to the firm tail more than the others I was able to demo . Although its 123 under foot it still handled the runout well on the groomed run . The Ogre 1 did not float like the Ogre #2 nor the Ogre 8 for ovious reasons . I had a tough time in the moguls ( not a bump skier) but it was better than the Ogre #2 & #8 . I did not enjoy them on the ice . On the big dump day I took it out it was cold 18F and 2' to 3.5' deep in places I liked that the ski kept me on top everywhere I took it ~ couple that with the anti dive tip and this ski works well at keeping you from struggling to stay on top . It's Quick to turn but doesn't handle the thick crud as well as the Ogre #1. I think because the Ogre #1 is a stiffer ski. Not an ice or Mogul ski . This ski is flat out a monster on the big pow days ! Like nothing I have ever seen in the industry with a bottom surface area 2,918cm2 . I took this ski out to a big wide open pow field with steep drop and yodeled the whole way down . The side cut in such a big ski made the turning easier than I expected it would be .With the anti dive tip I never dropped a tip ever ! . I'm looking forward to getting some pow days on this board this coming season . The Ogre #8 made everything effortless . Not an ice or mogul ski . Special note : I mounted my bindings two different ways , center off set for the wider stance , duck foot not sure I liked it , None of these skis are for super tight shoots or the ice ! One hell of a quiver ski I bought three Ogre 1 2 & 8 . What I liked best about these skis is they did everything I asked of them , the price was right and not everyone on the hill is on them for now anyway . At times I felt I had an unfair advantage over all the other powder heads !